systems thinking - a theory that explores the links among the seemingly unconnected and uses this holistic understanding to re-imagine current systems through elegant and innovative design. This methodology can be used to help organizations and individuals move beyond problem-solving to discover and implement patterning or structures for long-term health and wellbeing. accessibility - envisioning a healthy food system for land and people as a right for all, rather than a privilege. diversity - we enter the system where we are, as we are and hope the discussion will only broaden with time to include a variety of voices from across cultures, races, genders, ages, and identities. collaboration - a work in progress that we all contribute to, taking turns to both lead and listen. About 15 of us gathered around a table to see what could happen when we asked each other a few questions and shared our ideas. We started with a Check-in Question - when were you last on a farm? 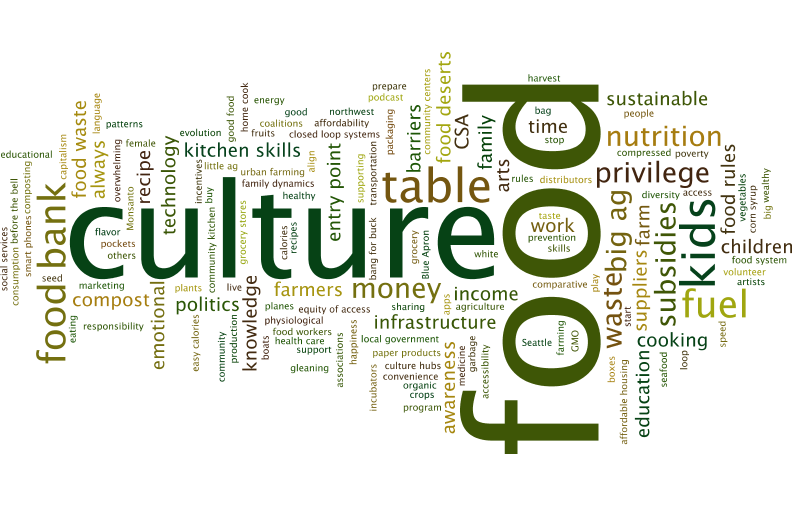 The discussion split into two groups to delve into production/consumption (the whys and whats of the system) and culture (optimal conditions for eating and digestion, the importance of community, cuisine). After a time, the dialogue merged and we took from it a framework for future conversations.